Employees that reached a service milestone were presented with this crystal award at the annual Celebrating Service breakfast this week. UC Merced honored nearly 200 employees for their loyalty to the university and higher education at the annual Celebrating Service breakfast earlier this week. 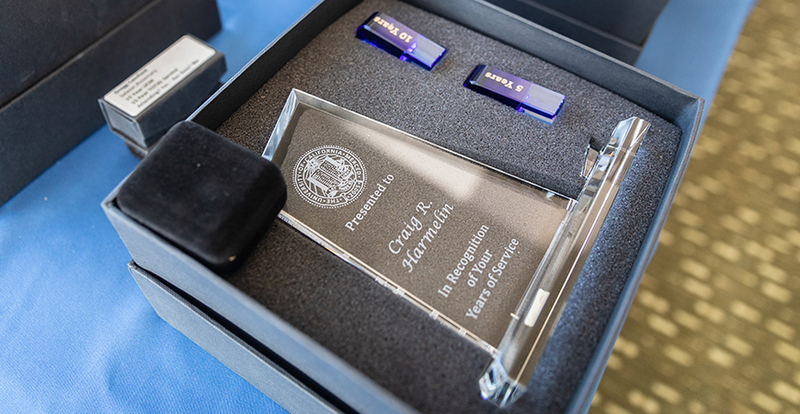 Those honored each received a crystal award with milestone markers for their service to UC Merced and lapel pins for their total service. A service milestone is reached every five years. Division leaders for the employees shared a few words about the employees’ impact during their years of service. The event was staffed by members of the UC Merced Staff Assembly Executive Board and staff from the Office of the Chancellor and Human Resources. The full list of recipients can be found online. A slideshow of the Celebrating Service breakfast.